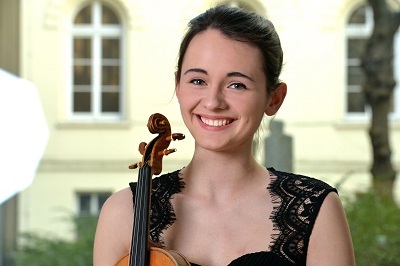 Anne Luisa Kramb, born in Aschaffenburg in 2000, started playing the violin at the age of four. After important years with Prof. Susanne Stoodt and Prof. Herwig Zack, She is currently studying at the renowned Kronberg Academy in the violin class of Antje Weithaas. She was awarded several first prizes in international violin competitions, as for example in the Mlody Paganini Competition in 2014, the Telemann Competition in 2015, the Knopf Competition and the Internationale Louis Spohr Competition for Young Violinists in 2016. Additionally, Anne Luisa was a finalist and prize winner in the International Yehudi Menuhin Competition in London 2016. In September 2017 she won the Manhattan Music Competition and gave her debut in the renowned Carnegie Hall. She gained experiences as a soloist with orchestras as for example the Staatskapelle Weimar, the Symphony Orchestra Goettingen, the Filharmonia Sudecka (PL) and the St. Andrew Orchestra Edinburgh. Anne Luisa was invited to international festivals, including the Festival Emanacje in Krakow (PL) and the Weilburger Schlosskonzerte. Chamber music with the pianist Julius Asal became an important part of her yet young career: the duo is invited to play at the Rheingau Musik Festival, the Festspiele Mecklenburg-Vorpommern, the Musiktage Alsfeld and gives concerts in Germany, Austria and the United Kingdom. The young violinist got important musical influences by international personalities such as Antoine Tamestit, Ana Chumachenco, Gidon Kremer, Anne-Sophie Mutter and Donald Weilerstein. Anne Luisa is playing a violin by Enrico Rocca (Genua, 1900), which is provided by the Deutsche Stiftung Musikleben. She is supported by several foundations, such as the Jürgen-Ponto-Stiftung, the RC Alte Oper Frankfurt, RoundTable Germany and the Oscar and Vera Ritter-Stiftung Hamburg. If you are interested in working with Anne, please get in touch with the EMCY Office.